Accor – Newsroom | Swissôtel launches new "Vitality on-the-go" wellness packages in partnership with TOMS Bags. Swissôtel launches new “Vitality on-the-go” wellness packages in partnership with TOMS Bags. New York, June 28, 2016 – Travel doesn’t have to be all hustle and bustle, it can be an opportunity to recharge and reconnect to one’s mindfulness and wellbeing. 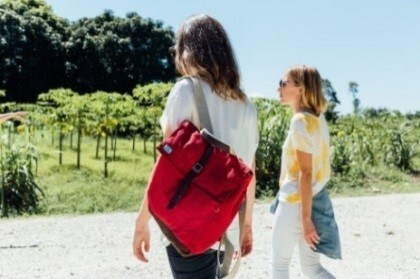 Helping guests maintain their mental and physical fitness while on the road is the intent behind a new series of packages set to launch July 1 at Swissôtel in partnership with TOMS Bags. The new Vitality On-The-Go packages include one night in a beautifully designed guestroom and feature the added gift of a TOMS Bag, a 25oz Swell bottle that keeps liquids cold for 24 hours and hot for 12, and specially crafted and illustrated thought-provoking adult colouring postcards with accompanying podcasts. For each bag purchased through this offer, TOMS will help provide a safe birth for a mother and baby in need in Bangladesh, Ethiopia, Haiti and India. Each postcard integrates six universal dimensions of Swiss wisdom that relate to: vitality, authenticity, tradition, hospitality, calm and clarity. The cards were designed by Swiss illustrator Sebastian Fässler and include thoughtful and inspiring texts by Swiss writer Myriam Zumbühl. The postcards are linked to six podcasts that inspire the mind and are intended to spark joy and happiness among travellers. Guests are invited to listen to the podcasts, colour in the postcards, add their own message and reflect on each topic. When they are done, they can give their postcards to any Swissôtel colleague, who will mail them free of charge to a family member or friend to spark ideas and start conversations, extending the guests’ impact beyond their stay. These customized experiences also include a $25 F&B credit, which can be used towards Vitality On-The-Go offerings to stay fuelled while spending time outside the hotel. Guests can also gain access to complimentary in-room fitness equipment and exercise cards. For more information or to book today go to: http://www.swissotel.com/offers/deals/vitality-on-the-go/. Conveniently located where travellers want to be, Swissôtel Hotels & Resorts provides guests with the opportunity to stay in the heart of more than 30 top locations worldwide, where they can confidently explore the very best each destination has to offer. Synonymous with all there is to love about Switzerland, the brand remains true to its roots, successfully combining genuine Swiss hospitality with intelligent design and local flair. With social responsibility at the forefront and a genuine commitment to positively impact the destinations it calls home, every Swissôtel upholds industry-leading sustainability standards and is committed to treating guests, colleagues, and the environment with equal respect. This all comes together to provide guests with peace of mind that is authentically Swiss. Part of FRHI Hotels & Resorts, a leading global hotel company that also operates the Fairmont and Raffles brands, the Swissôtel portfolio offers business and leisure guests an authentic and local travel experience that is full of energy, passion and vitality. For more information or reservations, please visit Swissôtel.com.